The Martin Mania DC3 is the third dazzling decoration fixture in the Mania series. • No duty cycle – no stopping your show - lights all night! It is a decoration tool which projects sensational oil wheel images and creates psychedelic decoration effects at any show, club or party. A variable focus allows you to blur the edges of your projected image while a variable speed control lets you keep pace with the music. Gobos can also be placed in the Martin Mania DC3 to frame the oil wheel image and give depth to your show. 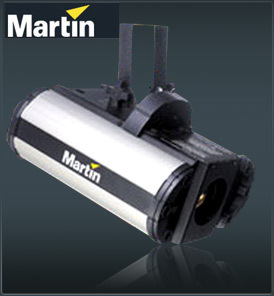 As with ever fixture in the Mania range and unlike most other lighting fixtures on the market, the Martin Mania DC3 has no duty cycle, which means there are no cool down periods and no stopping the show.